This is just a fun read. I bought it several years ago and it has passed the test of time. In fact, I’ve read it several times! It’s that good. The story is about Captain Drake Nickless (don’t you just love the name?!) and the lovely and spunky Lady Emily Camden. This is a story that is sweet and innocent, yet adventurous and interesting. It takes place during the time of Queen Elizabeth and the threat of the Spanish armada. Of course the two main characters fall in love. Unfortunately, there are problems (or there wouldn’t be much of a story!). Emily tries to help out a friend and ends up with some nasty consequences. There are not one, but two really bad guys that our hero and heroine have to deal with. All is not easy and all is not necessarily a happy ending, but the end is quite satisfying. It was so fun to read this review. 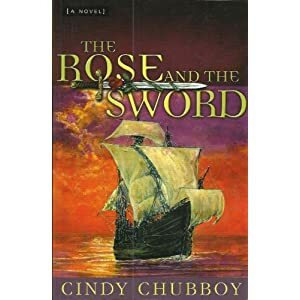 I also enjoy reading The Rose and the Sword, my mother is the author. If you enjoyed this book you should also look for The Flame of the Desert, she wrote this one as well and it’s my personal favorite. I will have to look for that one! I was hoping your mother wrote more books. She’s so talented! Does PPH sell it?